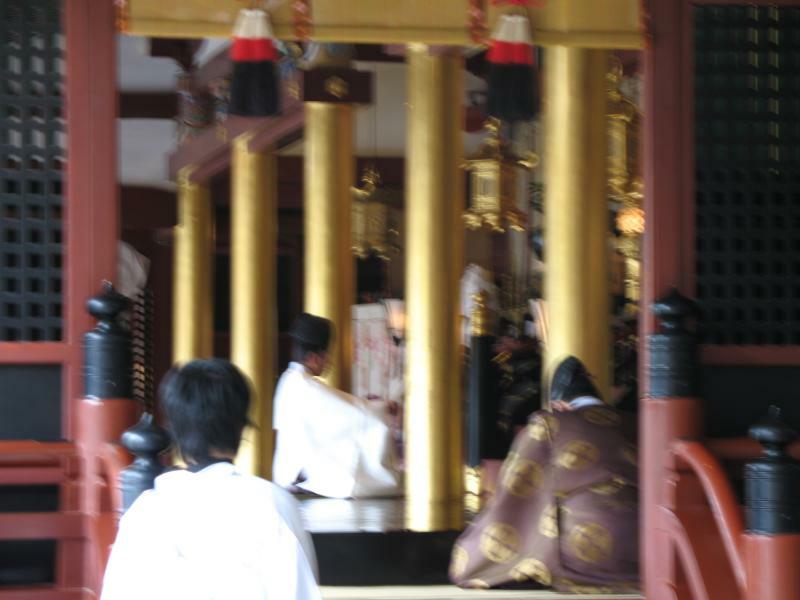 When I was writing about Jizō in my last post, I realized that I hadn’t mentioned my trip to Nara. I’ll fix that now. Way back in December, I made a day trip to the city of Nara, which was the capital from 710 to 784, and also the first permanent capital in Japan. Previously, the court moved after each emperor’s death. 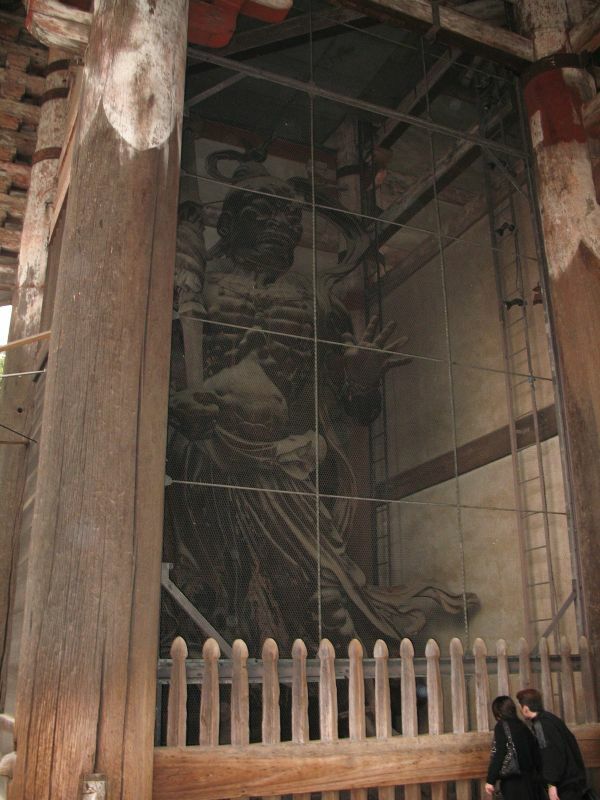 The changing of this custom was part of the adoption of Chinese culture that was occurring at the time. 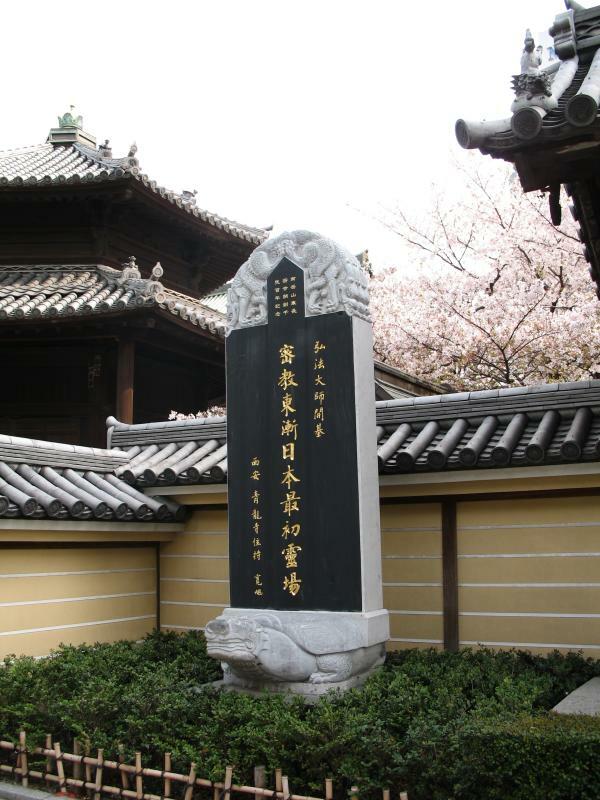 Chinese writing, art, architecture, laws, and Buddhism were all actively taken up by the imperial court. You may wonder: If Nara was supposed to be a permanent capital, then why did it not keep that status for long? What happened was that the Buddhist temples, which were imperially sponsored, had grown too powerful and were meddling in politics. It got so out of hand that the emperor finally decided to move the capital to distance the court from Nara’s temples. 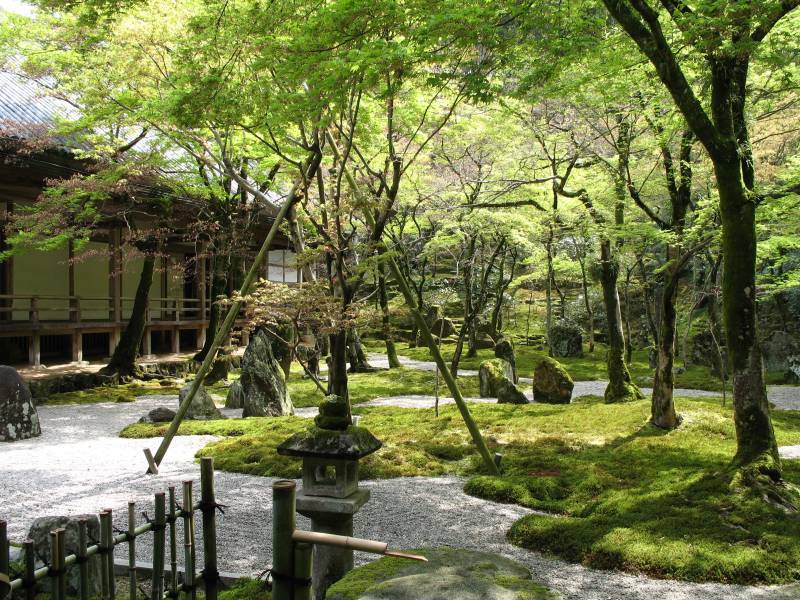 In 794, Kyoto was founded as the new capital. 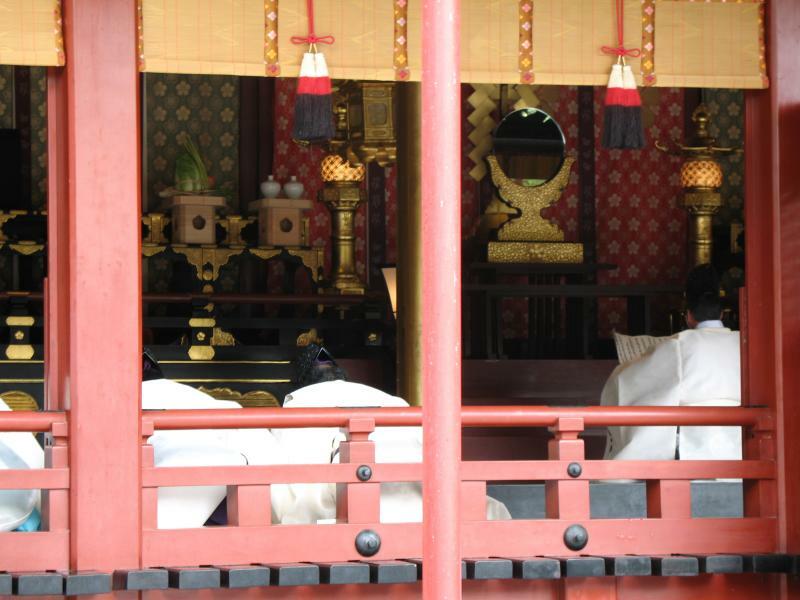 The imperial court remained in Kyoto until 1868, although after 1185, real power was held by the shoguns, who ruled from Kamakura, then Kyoto, and then Edo (which became Tokyo). I’m getting sidetracked. Nara. 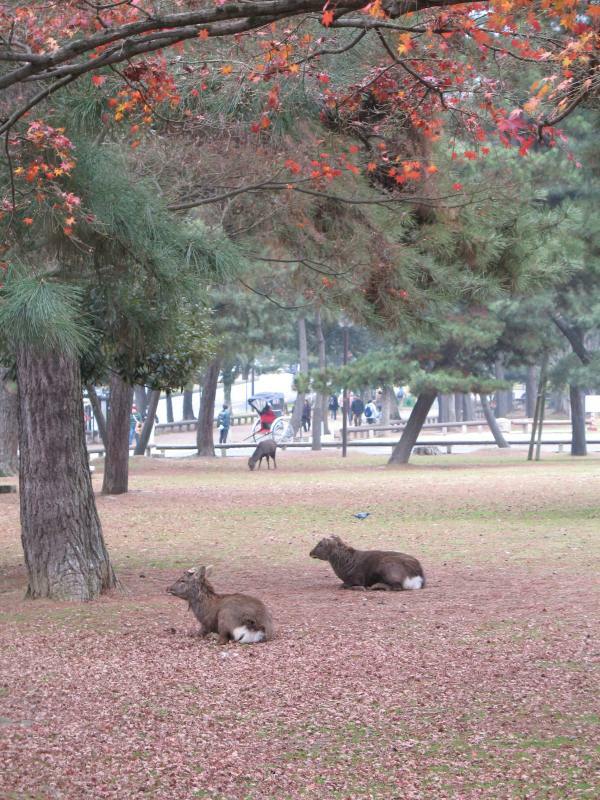 Nara is directly east of Osaka and directly south of Kyoto, isolated from both cities by mountains. Today, it has a population of about 370,000, and is more relaxed and rural than its big neighbors. 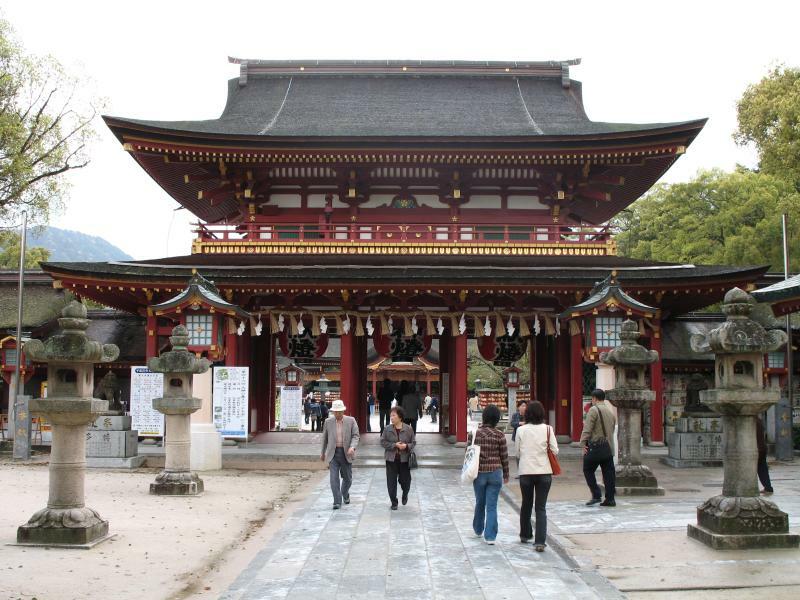 Nara’s temples declined significantly after the court left, but the most important ones have stuck around. One of these is Kōfuku-ji. Kōfuku-ji is the clan temple of the Fujiwara family (the bad guys from the last post) and thus retained its splendor while other temples diminished. It has an impressive collection of status and other artifacts, with a museum displaying the works that aren’t in active use. This is one of the many buildings in the complex. To my utterly untrained eye, the design seems much more Chinese than later Japanese temples, which would make sense. 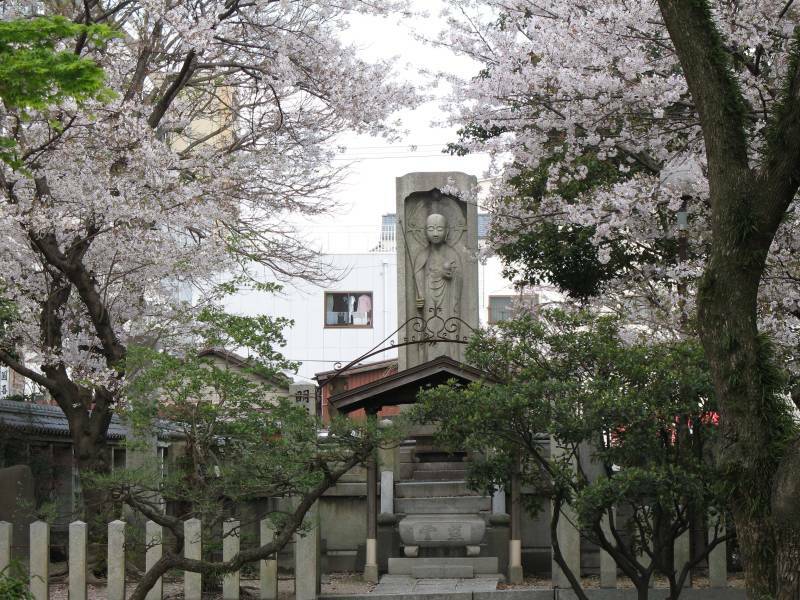 These are the statues of Jizō that I was reminded of. They are just downhill of the round hall. You can see the little cups placed by the statues. A sad sight when you know what they signify. 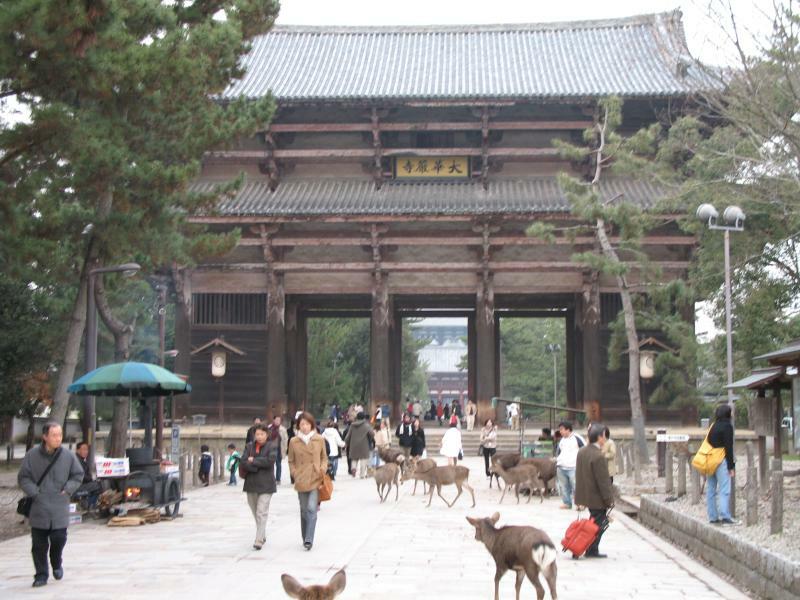 Directly east of Kōfuku-ji is Nara Park, which contains an important shrine, the temple that houses Nara’s main attraction, and a national museum. This building is currently the museum’s Buddhist art library. 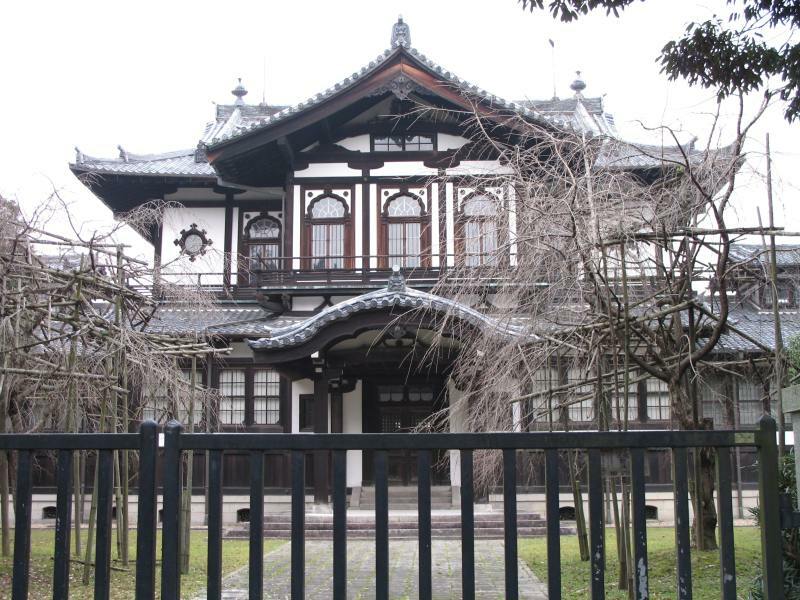 It was built in 1902 and is a particularly handsome example of Western-influenced Japanese architecture from that period. Getting back to the park itself, everywhere you go, you’ll encounter semi-tame deer like these. The deer were once regarded as divine messengers and it was forbidden to harm them. They’re generally well behaved, but they’ll hound you relentlessly if you have food. There were droves of the critters in front of Tōdai-ji, Nara’s most important temple. They were probably attracted by the carts selling roasted chestnuts. There were no deer inside the gate, though. There could be a number of reasons for this, but one is tempted to think that the gate guardians are scaring them away. These guys are the Buddhist equivalent of angels with flaming swords. Evil beware. 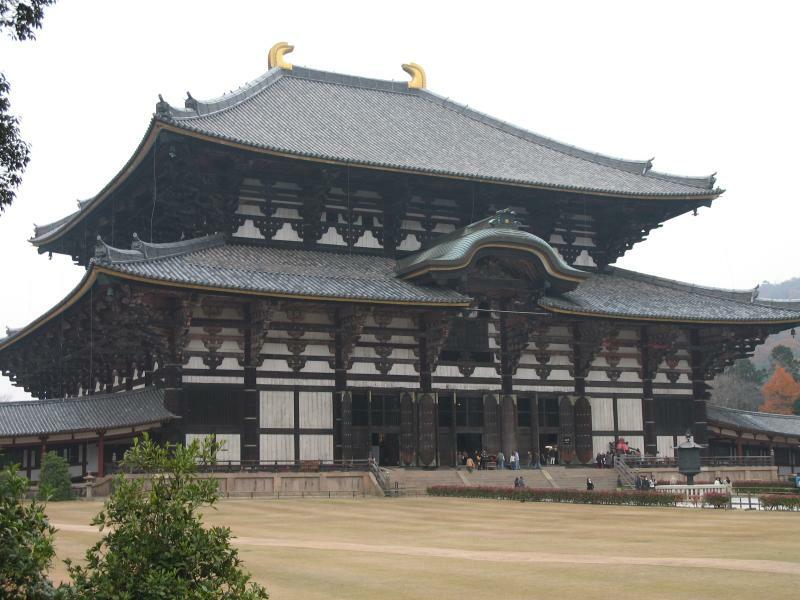 Beyond the intimidating guardians lies another gate and then the main hall, purportedly the largest wooden building in the world. 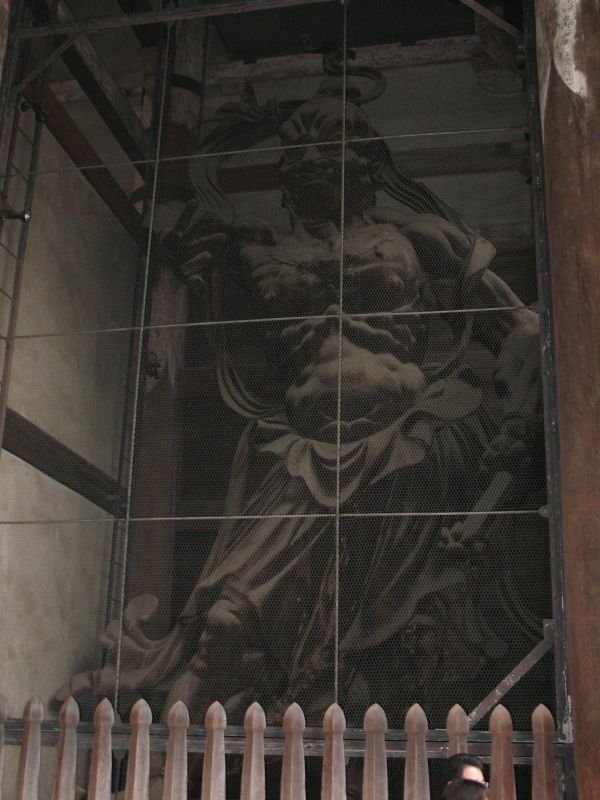 For all its size, this 1704 construction is only two-thirds as large as the 751 original. 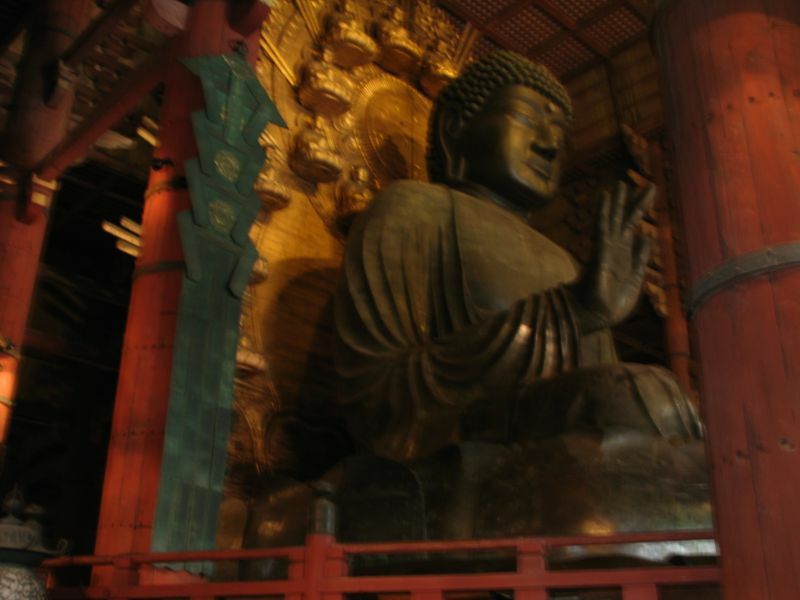 Inside is the famous Great Buddha statue. After Tōdai-ji, I wanted to visit Kasuga Shrine (the one I mentioned above). Alas, it was too late in the day, and the shrine was closed by the time I got there. I’ll have to go some other time. 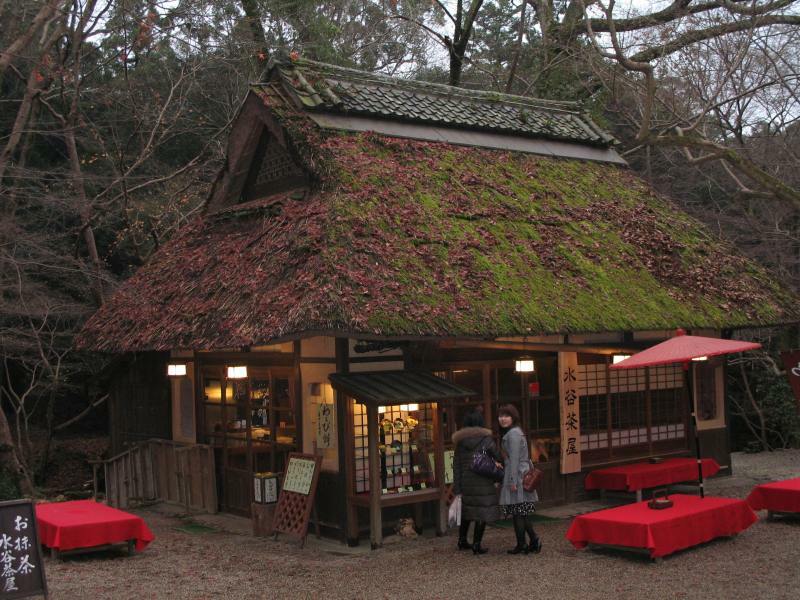 But at least I happened to pass by this teahouse with a neat roof. The hydrofoil ferry between Japan and Korea lands at Fukuoka on the Japan side, and I spent a few days there on my return trip before taking the bullet train back to Kobe. 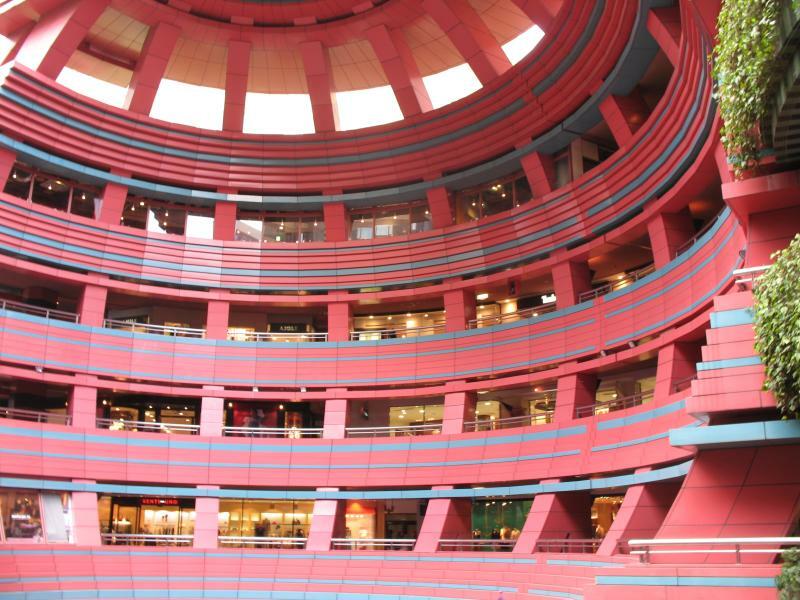 With 1.5 million people, Fukuoka is the largest city on the island of Kyūshū. You can see it on this map I dug up. Kobe, by the way, is just west of Osaka. Fukuoka is a nice city, both relaxed and lively. It has been the gateway to the mainland for as long as people have been making the trip, and is possibly the oldest city in Japan, although you wouldn’t know it from looking at it. 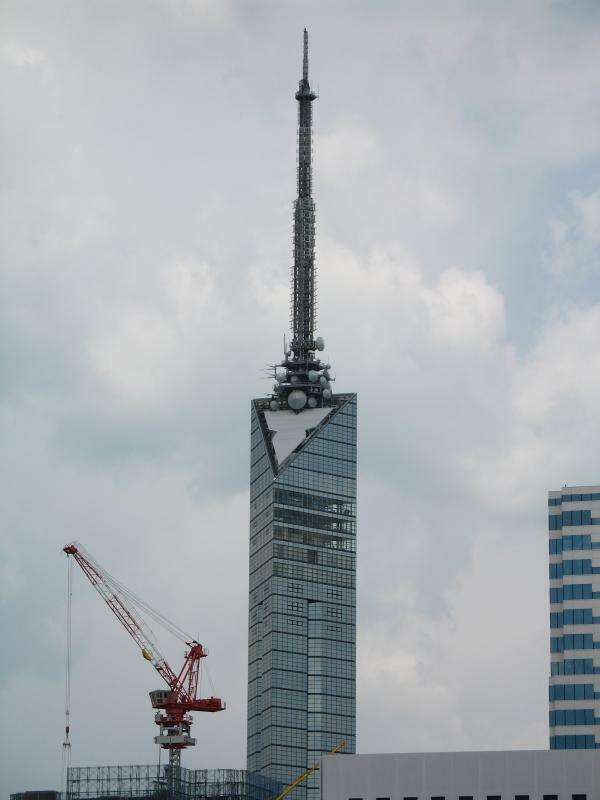 Current icons of the city include buildings like Fukuoka Tower, bristling with communications equipment . . .
. . . and Canal City, a large shopping and entertainment complex, which in addition to stores, includes dozens of restaurants, a cinema, a theater (for live theatre), and two hotels. I just stopped by Canal City for lunch and then moved on. I’ve never been much for malls, even über-malls. 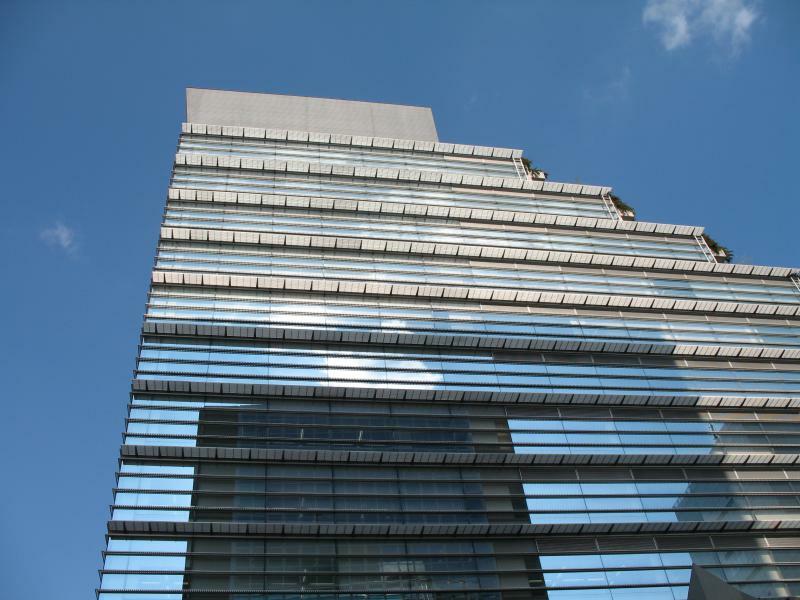 But while I’m on the topic, Fukuoka’s most famous bit of architecture is probably the ACROS Building. 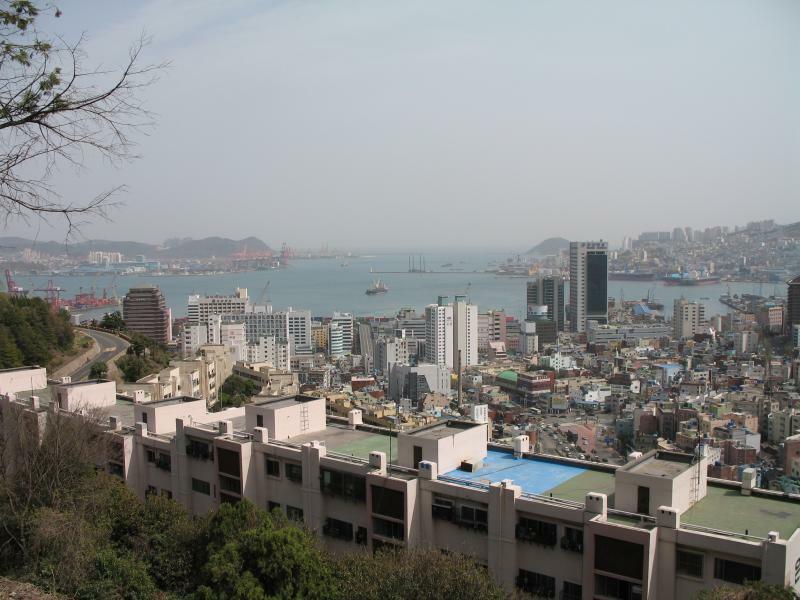 ACROS – Asian CrossRoads Over the Sea – houses offices, conference facilities, a symphony hall, and an art gallery. 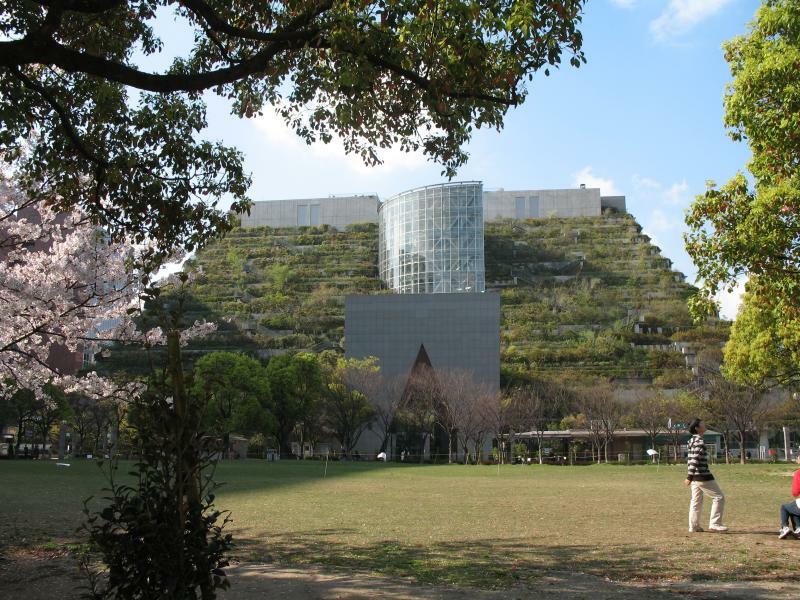 Three sides of the building are gleaming but unremarkable glass . . .
. . . but the other side is a step garden that blends the building into the adjacent park. 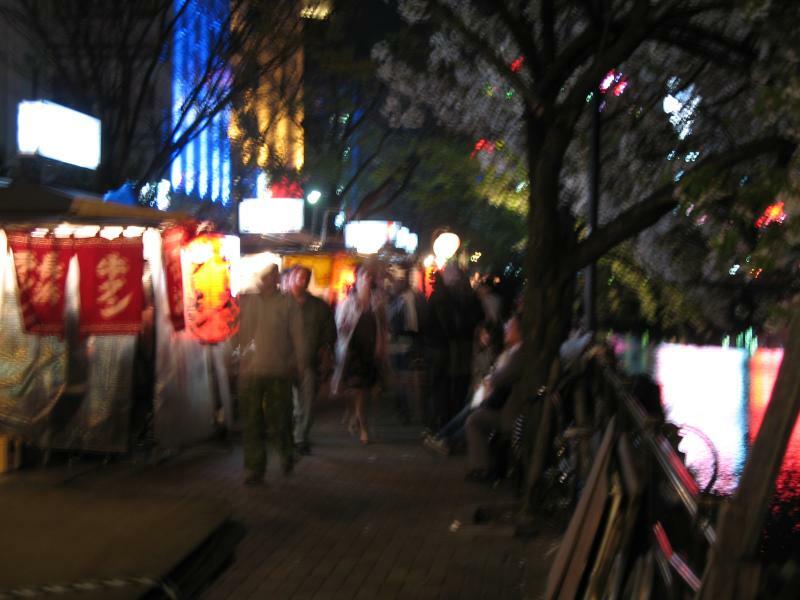 Another thing many people will think of if you mention Fukuoka is riverside ramen stands. 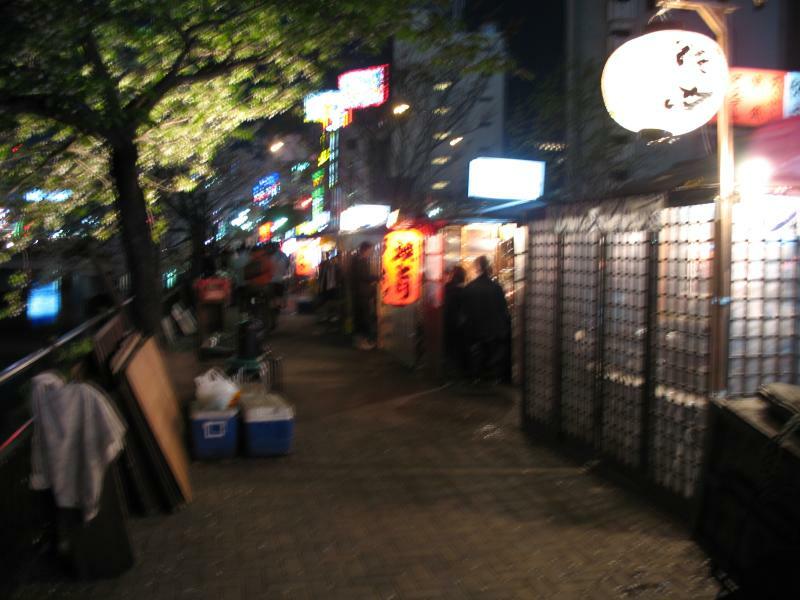 These stands, called yatai (“carts”), are related to the food stalls ubiquitous at festivals throughout Japan, but I’m told that Fukuoka’s numerous yatai, out every evening, came about during the hard years following World War II. Inside a yatai, about a dozen people crowd around the steamy counter, seated at benches and shielded from the elements by plastic tarps. Not all ramen is equal. Some yatai had long lines outside and others were looking rather lonely. Alright, blast it, this post is taking too long, so this will be part one. More later. It’ll probably be another week before I get to my post on Fukuoka. Among other things, I’m preoccupied by my upcoming 90-minute English lesson for my school’s PTA this Wednesday. I don’t know how many people will be there or where their ability levels will be (all over the map, probably), and I’ve never taught adults before. But the best part is how I found out about this task. A week ago a pair of PTA members came into the teachers’ room after school, approached me, and said (in Japanese), “We want to have an English conversation class. We talked to the vice principal and he said you’d do it . . .” Yeah. At least they gave me notice. But enough whining. Like I was saying, it’ll be a while longer before I have time to write up my intended post, but in the meantime, there is one more thing from my trip to Korea that I forgot to mention. One particularly striking aspect of modern South Korea is the degree to which Christianity has taken root. During my trip, I was approached by Jehova’s Witnesses three or four times and twice by members of a Korean church that seemed similar to Seventh-day Adventists. Apparently, Korea is the second largest source of Christian missionaries, after the US. Looking out over Seoul at night reveals red neon crosses throughout the city. About 28% of South Koreans are Christian, with Buddhists accounting for 23%, 1% for “other,” and the rest not claiming any particular religion. In Japan, meanwhile, less than 1% of the population is Christian. Why has Christianity taken off in South Korea and not in Japan? There are a number of reasons. One reason is the existence of a supreme creator deity in Korea’s rather amorphous, native, shamanistic religion that was around before Buddhism swept in. There were demigods in this old folk religion, but as the creator was the unchallenged god, total monotheism wasn’t much of a conceptual leap. 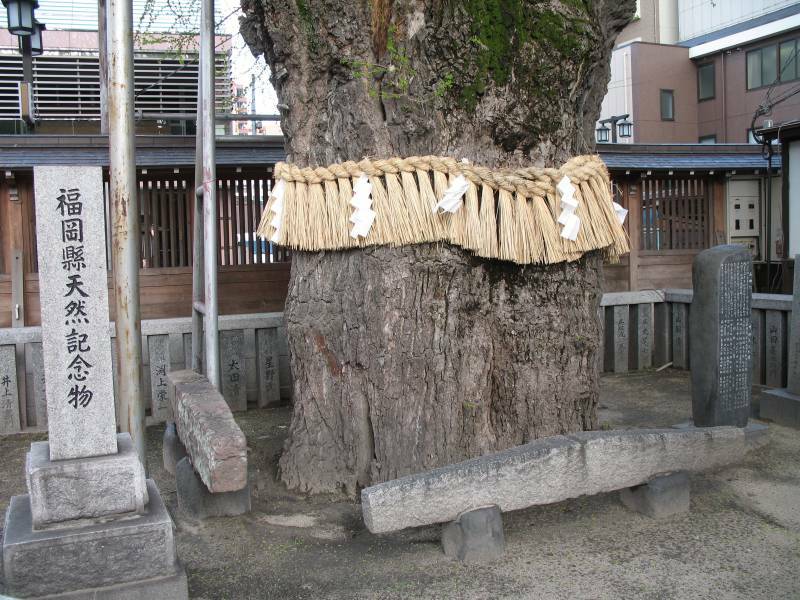 But in Shinto, Japan’s pre-Buddhist folk religion (which is partly tied to the imperial institution and has mostly coexisted with Japanese Buddhism in a complimentary relationship), there are innumerable “kami.” Kami is translated to “god,” but the concept is different from gods in Western polytheistic traditions (e.g. ancient Greek gods) and it’s nothing like the Judeo-Christian God. 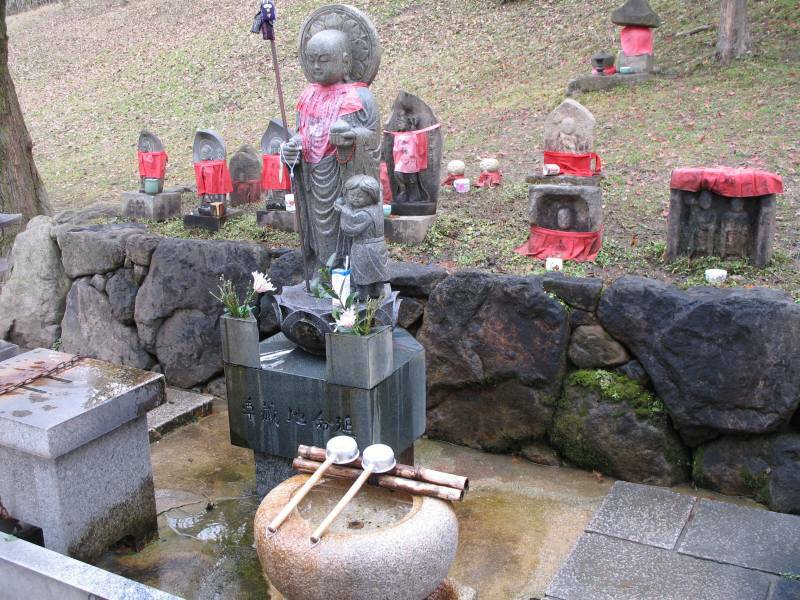 Monotheism and a land devoid of kami is an alien world-view in Japan. The other reason is a matter of history and identity. When Christianity entered Japan in the 16th century it gained some converts, but along with declaring national isolation, the Tokugawa Shogunate outlawed Christianity as a foreign faith that subverted people’s loyalties. Today, Japan has freedom of religion guaranteed in its constitution, and there are about a million Christians in the country, but Christianity doesn’t lend itself to the syncretism embedded in Japanese culture. Christianity came to Korea at the same time it entered Japan and it also had a rocky start. I don’t think it was banned, but Christianity was severely criticized by Neo-Confucian scholars. However a group of anti-establishment scholars embraced Christianity for its egalitarianism, and churches were founded in a native movement, without the assistance/control of foreign churches (which is an important detail). I’m skipping some significant history to wrap this up more quickly. During the Japanese occupation (1905-1945), Korean churches became associated with nationalism and the resistance movement, because they refused to take part in Emperor worship, which was made mandatory in the 1930s. Thus, Christianity became viewed not as a foreign religion, but as patriotically Korean. Today I joined the 7th graders on a field trip. We planted rice seedlings and potato cuttings. On Monday, Tuesday, and Wednesday of last week, the conference for re-contracting JETs in western Japan was held in Kobe (eastern Japan’s is in Tokyo). The conference is only for first-time re-contractors, not for those going into their third year, but there were still about 900 of us [edit: not 1,800; that’s the national total]. Everyone, including Kobe JETs, was given a room at the hotel where the convention took place. I stayed the first night at the hotel, but one of my two roommates snored unbelievably loudly, so I slept at home on Tuesday. Blessed silence. After Seoul, I returned my port of entry, Busan, where I stayed for two nights. Busan (“Pusan” is an older Romanization) is Korea’s second largest city (~3.6 million) and its largest port. Here’s a view of the bay. Busan isn’t exactly the most exciting place in the world, but it does have some interesting spots. 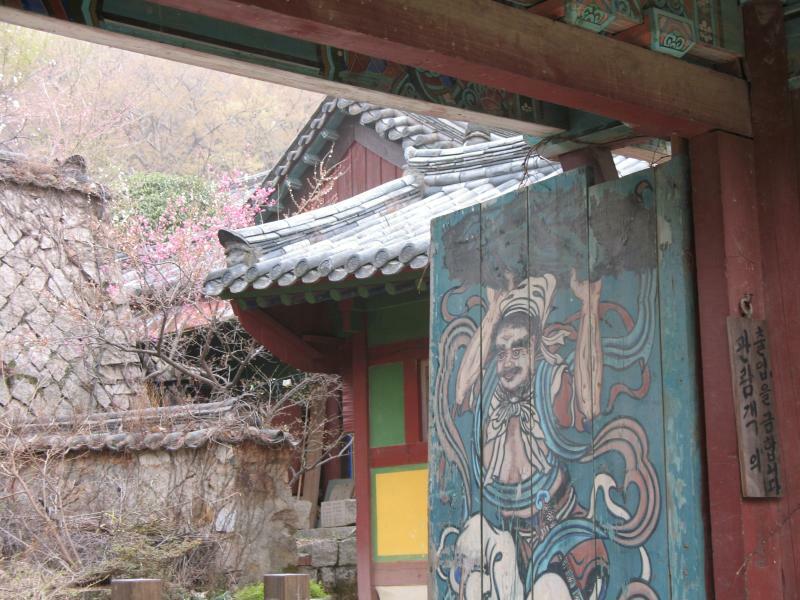 Beomeosa (“buh muh sah”) is a Buddhist temple in the mountains north of Busan. 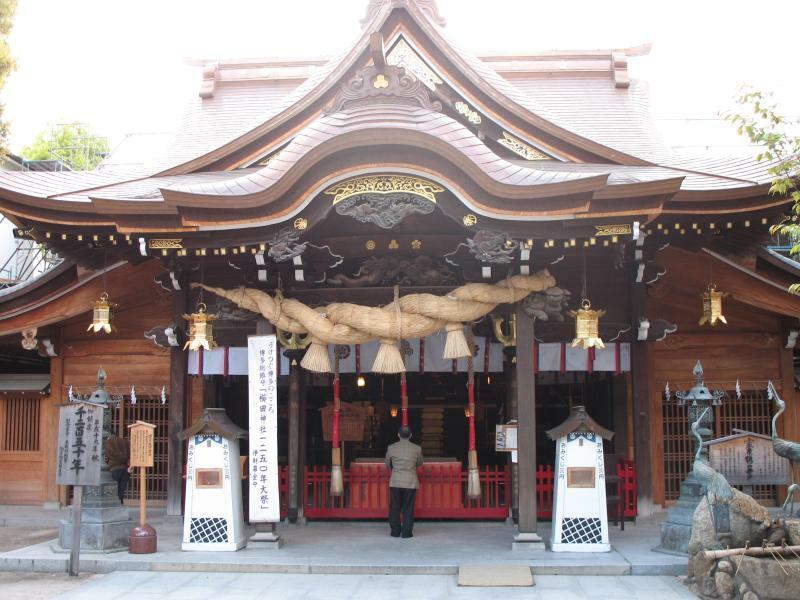 It was founded in 678 and is still an important and active temple today. 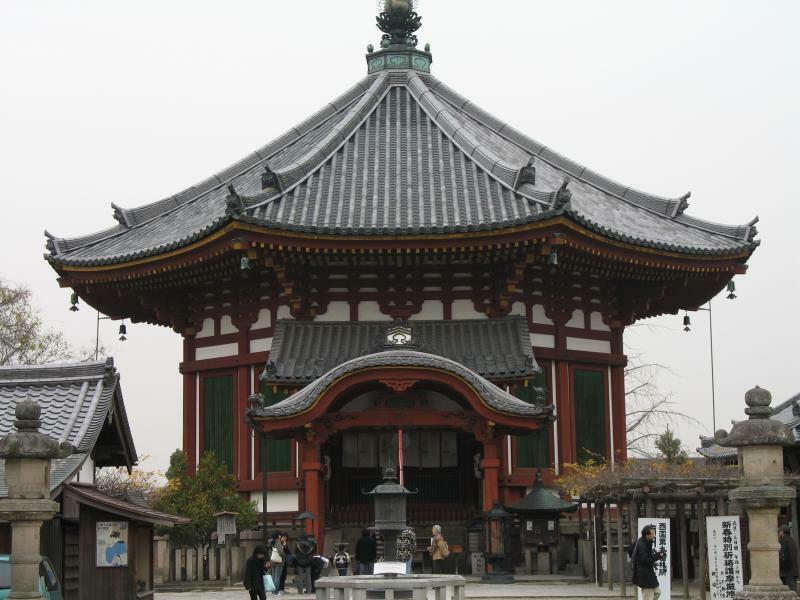 However, none of the buildings are more than 400 years old, as the temple was burned down during – I’m sure you can guess by now – the Japanese invasion of the 1590s. 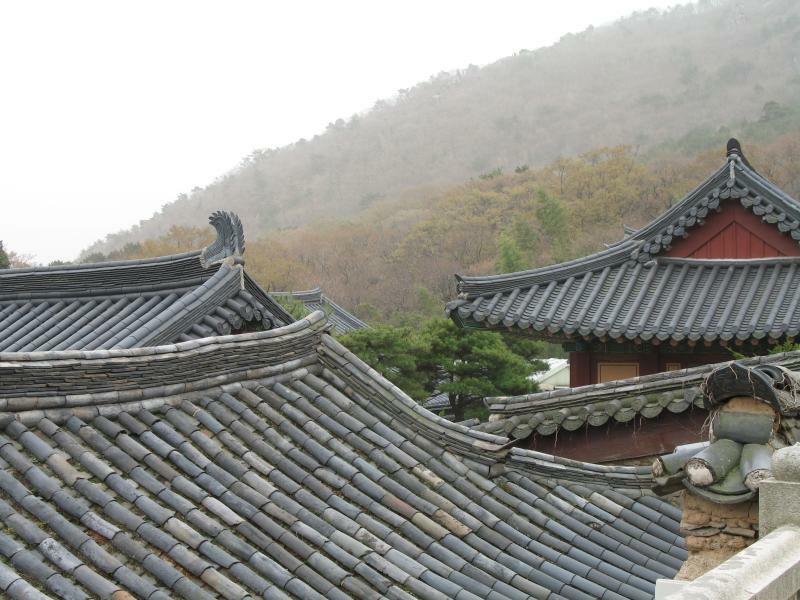 I appreciated how, although the roofs are patched with concrete in spots, they haven’t been given conspicuous concrete frames like the palaces in Seoul. It was the only one I saw that had a picture, but I think it’s just a random decoration and not a sign of any particular significance. There were a bunch of these monuments leading up to the temple. I have no idea what they are. They were all slightly different from one another, but each had a turtle as its base. 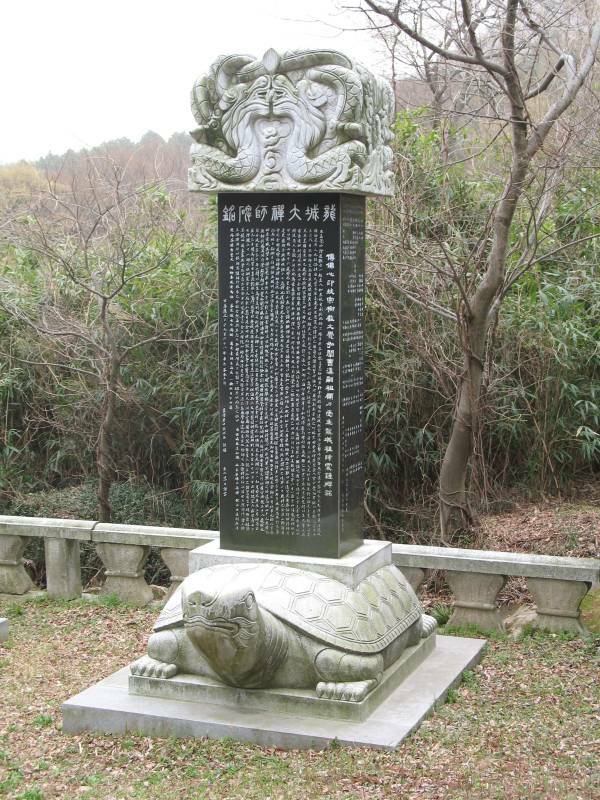 The inscriptions are in Chinese. 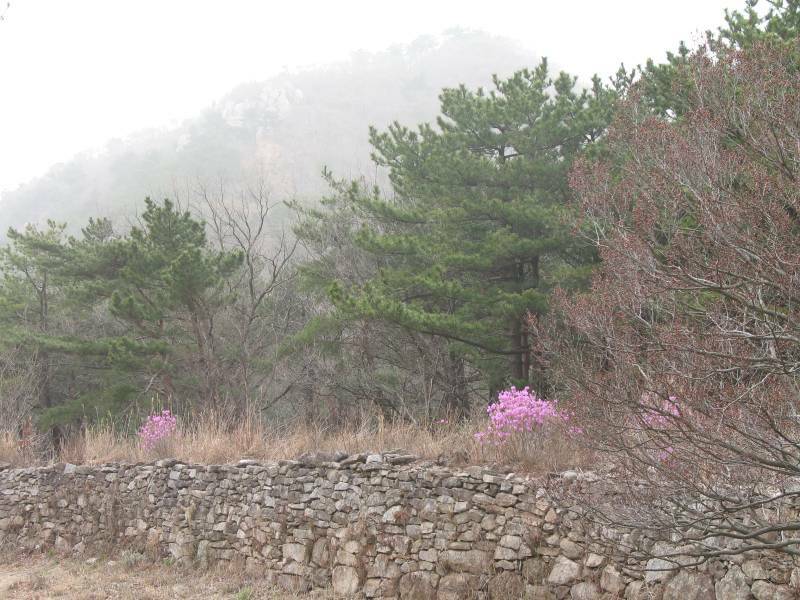 After Beomeosa, I went to see the ruins of a fort in the western mountains that has a wall stretching several miles. Unfortunately, the part I visited was one of the more boring sections, although still good for a hike. This was about all there was to see. I should have been afforded a fantastic view of the city, but the white haze that you can see in the picture obscured everything beyond a certain distance. At first I thought that the haze was fog, but when I actually paid attention to it, it became obvious that it was something else. As the day progressed the haze grew increasingly thick. Back down in the city, people were covering their mouths and noses with handkerchiefs and some wore surgical masks. Eventually I couldn’t see the end of the block, and when the light breeze blew into my face it stung my eyes. So what was this nastiness? Dust from northern China. Yup. After six days in Korea, I took the hydrofoil ferry back to Japan. I spent a couple days in in the city of Fukuoka (which is a post in itself) and then took the bullet train back to Kobe. My trip to Korea was sometimes stressful – I traveled alone and I don’t know the language – but I’m really glad that I went. It was fascinating to experience a different culture, and despite many shared influences, Korea is very different from Japan. There are little things, like how Koreans use metal chopsticks and eat rice with spoons, and then there are significant differences in how people interact. People yell a lot. They don’t have the Japanese’ extreme concern about imposing on others. Once, when I was riding the subway, an umbrella seller made his way through the cars, loudly hawking his wares. For a couple seconds, before I figured out what he was doing, I was worried that he was drunk or mentally ill. On another train, a couple of college students were soliciting donations for some sort of charity, loudly giving their spiel to the whole car before going to each person with their collection box. These intrusions, which would be unimaginable here in Japan, weren’t exactly welcomed by the locals, but they were clearly regarded as being perfectly ordinary. Well, I could keep rambling, but I’m tired and its getting harder to arrange my thoughts into anything coherent, so I’ll end this here. Next time, Fukuoka. Ah, but one more thing: Congratulations Susie and Ronald! May you have health and happiness in abundance. You are currently browsing the Erratic Dispatches blog archives for June, 2007.